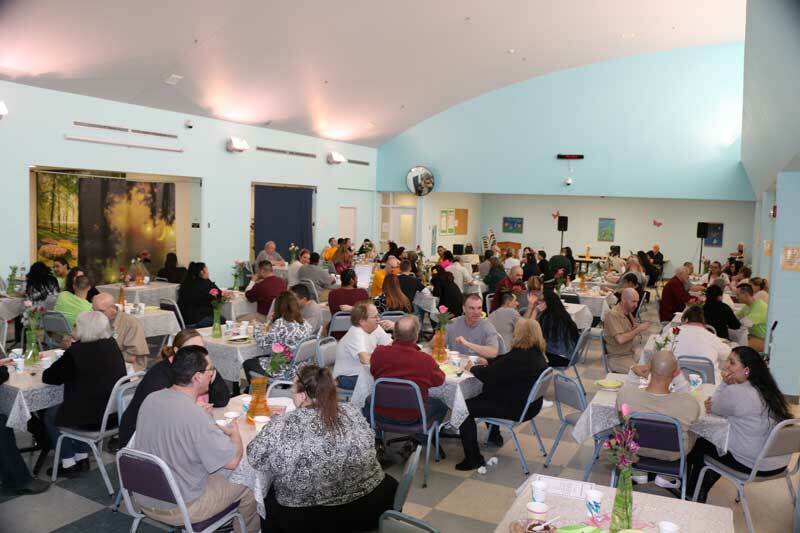 SPOKANE – Airway Heights Corrections Center (AHCC) commemorated Women's History Month by hosting its first "Celebrating Women" event on March 9th. Each inmate participant chose one special woman on their visiting list to celebrate as an honored guest, and they were also allowed to invite up to two more adult visitors. A total of 35 inmates participated with 62 visiting guests. Inmates wrote letters to their honored guest declaring why she was being celebrated. The letters were copied onto special note paper and presented with a rose to the celebrated women. Participants and their guests also had a commemorative photo taken and enjoyed listening to live guitar music provided by a volunteer. During dinner, Toastmaster's volunteer Nancy Shatto presented a speech focusing on honoring the women in their lives. The afternoon ended with prizes being handed out to lucky visitors. Many visitors and inmates alike commented that "Celebrating Women" was a wonderful and special event and appreciated the opportunity to participate. A special thank you goes to many who made this event a success including volunteers from Toastmasters, Church of Jesus Christ of Latter Day Saints, Freedom Project, Alcoholics Anonymous, the Airway Heights Sustainability in Prisons Project group, and the many staff who helped with set-up and donated decorations including the public access group, dining staff, and Custody & Community Partnership Program staff.